Road conditions in Canada, and the west coast in particular, are as varied as they come. We’re privy to any number of different weather and road scenarios, sometimes in the very same day. Depending on your choice of vehicle, your best weapon to combat the roadways is to outfit your vehicle with suitable tires to suit the types of roads you’re likely to encounter. All new vehicles come prepared for the everyday commute and a set of tires that have been researched and determined to be a great fit for your vehicle. This usually means an all-season tire – based on a rubber softness/firmness and tread pattern that compliments the qualities of the average, predictable roadway. But sometimes those all-seasons, or three-season tires as many Canadians call them, just don’t make the grade for some driving applications. If you live on a gravel road, or do lots of hauling and towing where the pavement ends, a good off-road tire is likely the answer you’re looking for. On the other end of the spectrum, if you drive a sports car like a Corvette or Camaro, you’ll benefit from a harder, lower profile performance tire designed to maximize traction, handling capability and steering feel. Both of these types of specialty tires are custom designed to give you the best responsiveness and performance for use in your specific environment. Their features are as varied as the number of models and treads you can choose from. Let us explain in a little more detail. Some of the most prevalent features that are integrated to most brands and models of high performance tires include a shorter, lower profile sidewall to help enhance cornering, as well as wider tread blocks, known as apex, for better dry traction and grip through hard cornering. These wider contact patches of rubber on the road help to propel the vehicle out of a corner without sacrificing speed. High performance tires can also feature stiffer/stickier rubber compounds designed to help boost grip and traction on both wet and dry roads. They also look incredible and give the visual appeal of a race car, or a high performance driving machine. 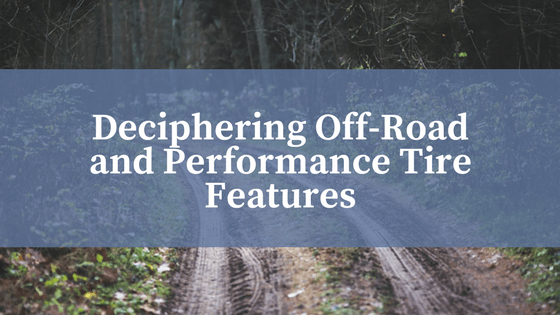 Some high performance tires may feature a directional, or unidirectional tread pattern. These symmetrical tread designs can do a number of things for performance driving applications like provide excellent wet traction and resistance to hydroplaning at high speeds in the rain. Directional performance tires also help reduce and dissipate heat from the main central rib, keeping the tire stiff and solid for improved high speed stability. These tires are designed to only rotate in one direction at speed, unlike the majority of most all-season tires which can be rotated any which way to improve their lifespan. The primary function of performance tires is to provide superior traction on the road. Meanwhile, the primary function of performance off-road tires is to provide the best traction possible off road. Off-road tires, this could mean gripping in the sand, dirt, mud, over stone, and even snow. Off-road tires are typically radials that feature pronounced, thick, deep treads designed to expose as many edges to soft ground as possible, adding a second element to traction rather than conventional rolling traction. On loose surfaces, off-road tires work by allowing the contact patch of rubber to access the ground underneath the loose material, thus providing recovered traction. Many models will also be slightly taller and wider than their all-season counterparts. A taller and wider tire give your vehicle more ground clearance to drive over obstacles, and the width determines how much of the contact patch can be spread over different surfaces. Off-road tires with aggressive, knobby treads will provide a smaller contact patch on-road as compared to standard all-seasons or street tires, which reduces their lifespan and slightly reduces their traction.There are all kinds of off-road tires that tackle specific environments and conditions from sand, stone and gravel, to extreme rock-crawling models. As our recommendation, an all-terrain off-road tire is likely all the additional grip you’ll ever need, specifically for someone who combines the everyday grind with some fun off-road on the weekends.